It’s become a bit of a tradition for me to make a Autumn themed ensemble in October, and photograph it in a local pumpkin patch. Last year I made an 18th century Redingote and the year before that, an 1890’s dress. This time around I wanted to venture into a period I’m a bit less familiar with – and slightly terrified of (fitting, since it is halloween, huh?) : The 1880’s. The bustle decades of fashion in general intimidate me. I think I understand how the dresses are supposed to go together, and the rough shapes the pieces should have. I mean I’ve read books about them, looked at original patterns, and scoured photos of dozens of extant garments! But I always get overwhelmed when it comes to making them, and had never finished one…until now! It has its problems, but I learned a lot and its made me way more confident about attempting costumes from this period, so I think it is a success – at least in my eyes! I went into this project knowing what period I wanted it to be from (the 1880’s) and what fabrics I wanted to use (orange silk shantung, black faille, and black sequined lace)…and not a lot else. I tried to design it without referencing fashion plates, since I wanted it to be somewhat original. I also wasn’t too concerned about historically accuracy – I was OK with it having some fantasy elements to it (like fake spiders. and sequins. and fake spiders with sequins on them). I figured that would take a lot of pressure off me when constructing it, which was good since I only had a week to make this! This was my first sketch, but I did make some changes as I got further along with this project. I decided to make the skirt first, so I could drape the bodice over the skirt and hopefully have a better fit. I also decided the skirt would be two layers. Layer one has a black base, with contrasting trim on the hem, and a sequined overlay. Layer two is orange shantung that has been pleated and trimmed to form a bustle. Both of these layers go on top of this petticoat, which I hemmed and pinned to be more appropriate for the 1880’s, and a lobster tail bustle straight out of Norah Waugh’s Corsets and Crinolines*. I put the foundations on my dress form, took measurements off them, and used that to create a underskirt pattern. Well, pattern might be a stretch! I figured out the dimensions of the pieces, then these were transferred directly onto the faille with chalk. This is the front panel of the underskirt. …And the finished underskirt. I wasn’t great about documenting this. The back panel is just a rectangle gathered to fit the waist, with a ruffle sewn on to the lower half to add volume. The waist was finished with ribbon, and closes with a hook at one side. Everything was stitched with french seams, except the top 10″ of the right side, which was left open to make the skirt easy to get on and off. I originally wanted to add dagged trim to the hem – to look like Jack o lantern teeth, but I didn’t have enough fabric. So instead I sewed together several rectangles of orange fabric, hemmed them by hand, then pleated them down to add texture. The pleats were kind of unruly, so I tack stitched them down 2″ away from the top edge. I also finished the top edge with binding, to prevent fraying. I topstitched the pleats on to the underskirt…and then top stitched black binding on top, because I realized the white binding I originally used would be visible through the lace overlay (oops). I don’t actually have any photos of adding the lace overlay, but it was effectively a three yard cut of lace that I trimmed hemmed, and gathered, until it fell just above the pleated trim. It was stitched onto the underskirt, just below the waistband. I was originally going to fussy cut the lace into the shape of trees and hand-stitch it on, but I ran out of time and the lace wasn’t really dense enough to do that. This is also the kind of beginning stages of my bustle. The bustle had three pieces – two “poofs” made out of rectangles with three sides gathered (the other edge makes up the hem, and was stitched by hand). And the front portion which draped down, and was made by draping the fabric and pleating it until I liked the shape. The pleats were tacked down by hand, and the back edges were bound. Then I pinned lace across the pleats to add interest. That was all stitched on by hand, too. And that was about it for the skirt! I added a waistband to the bustle layer, and a few hooks to keep is closed. There were also some plastic spiders added later, just for good measure. The bodice pattern was draped over all the skirts, and though I draped/patterned it myself, I used a lot of original pattern images as a reference when placing the darts and seams (you can see some of them here, if you scroll around). Then I transferred that to paper, and turned it into a mockup…which was way too big. Like so big I couldn’t even tell how well it would fit when taken in. I pinned the necessary alterations, then marked them all on my pattern. This was mock up number two, which still needed a few changes but fit surprisingly well! I loved the shape of the hem, and I thought the fit through the bust and shoulders was pretty great! Here is the “final” pattern. Most of the garments I’d seen from this period were flat lined. So I cut each piece out twice, once from shantung, and once from a lightweight canvas-y fabric. Each piece of shantung was backed with the canvas, then treated as a single piece. Unfortunately I didn’t realize until after sewing all my bodice pieces together that I still had a large needle in my machine, like the type you use with thick wools. It had caused the seams to pucker quite badly. I didn’t have enough fabric to recut the entire bodice, but I did re-cut the front panels. Here you can see the difference in the darts sewn with a silk needle (left) and one with the heavy duty needle (right). Changing your needle matters! Now I had to assemble the center panels before doing a fitting. These were made from the black faille, and lined with the canvas material. I bound the edges to prevent fraying, and used my machine to stitch 15 buttonholes into the left front panel. Then I sewed 15 buttons onto the other! Here is the first fitting (this is before I replaced the font panels, so ignore the puckers!) – somehow the black panel was too short, leaving a gap at the shoulder. So I had to add an extension there. But everything else looked really good! So I decided to add boning into the bodice. Most garments I looked at from the 1880’s had pinked seams, with boning sewn into the center. Though I wasn’t aiming for perfect historical accuracy (in case the sequined lace didn’t throw you off!) I did want to practice some historical techniques for future projects. I used spiral steel boning for this, since I thought it would bend well with the curved seams. I loosely whip stitched 3/4″ twill tape around the bones, then used more secure whip stitches to sew the bones into the bodice. Here is the interior – you can see the bones, and the grosgrain ribbon waist tape that I added. You can also see the bias binding, which I used to finish the bottom edge of the bodice. Now onto sleeves! I flat drafted these using a few measurements, but they were way too big. This is take two, which was better, but still not great. I think it took me three more attempts before I ended up with something I was happy with. I don’t have a worn photo, but this is the final pattern. The sleeves were…one of the more frustrating parts of this project. It seemed like no matter how I lined them, what I lined them with or how much ease I added, they wanted to wrinkle. Finally I attempted flat lining them with the canvas I used on the bodice, which seemed to work OK but still isn’t perfect. I realize now it must have been a drafting error…but I didn’t have any of those problems on the mockup! The sleeves have a velvet cuff, which covers the top edge of more pleated trim. I also stitched on more lace, and I tried to make it look like the lace was crawling up the sleeves. I sewed the sleeves onto the bodice, then trimmed the seam allowance down to 1/4″ and whip stitched it to the lining. 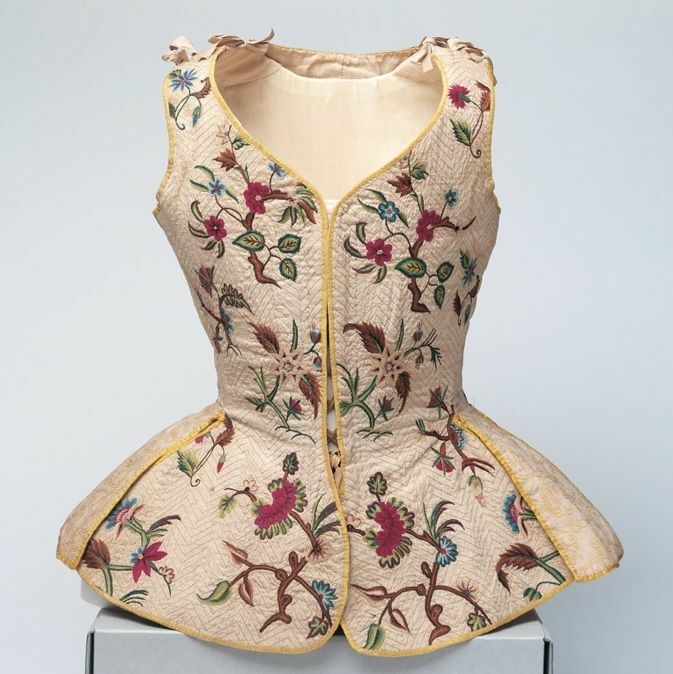 The bodice also got a collar (basically a 2″ wide rectangle with curves at the front) made of velvet and lined with faille. I like the contrast of the super black velvet against the less black faille. Then I added a bunch of lace to the shoulder of the bodice…and a couple of spiders. My whole concept for this is that the lace is a spiderweb. The final touch for this costume is the hat! It has a brim made out of buckram, a cap made from interfacing, and is generously decorated with lace and various halloween decorations. Including a whole fake bird I bought from michaels. The interior is lined with gathered tulle, and cotton. A comb was sewn in so it can sit at an angle without falling. Now up until this point, I was pretty happy with this project. And then I tried it on. And somewhere between adding the waist tape and sleeves, the fit became awful. Or not even the fit, the fabric just…rebelled against me. It puckered really badly and rippled down the back (not something visible in ANY of my previous fittings) and the darts at the front strained too. But I don’t think it was too small. Because the bodice almost gaped away from my back. Despite the fittings when making sleeve mockups going fine, it was suddenly really tight around the underarm and shoulder. But when the sleeve head was larger, it was baggy! I think these problems would have been less obvious with a cotton fabric, or something without a sheen to it. Unfortunately one of the reasons I gravitate towards shantung, is because of its sheen. I think I can probably fix it (or greatly improve it) by removing the boning in the back seam and taking it in slightly. I think removing the sleeves, letting them out, and cutting 1/4″ of material out of the armscye might help with the issue there…and I’m sure there are other fixes too. But even with its faults, I’m happy with this project. I like the design of it, the fantasy elements, and the fact I finally finished a bustle dress! That fact alone has given me the confidence to attempt more…and hopefully those will fit a bit better. I hope you’re having a lovely Halloween, and thank you so much for reading! I think this is my first costume photo set of the year. How wild is that?! These were taken a location we visit often – conveniently right next to a busy street where people can stare, and unruly patches of poison ivy. But there is fence and sometimes cute horses, so sacrifices must be made. These photos are of my 1840’s dotted dress, which I made over the course of a week and have spent the last month blogging about. You can read about the construction in more detail here, here, and here! This project was based on examples from the 1840s, and made from eight yards of quilting cotton using a self drafted pattern. Unfortunately my giant organza petticoat wasn’t done at the time I photographed this – so the skirt is lacking some of the fullness I had hoped for. But I don’t think that takes away from the pictures too much. Or at least I hope not! My least favorite part of this dress is the back – I feel like the fit problems I mentioned in my making of posts are a lot more obvious here. Taking it in at the back seam would help a lot, but the waistline should be raised slightly too. Thanks to the way I stitched the skirt on, that would be an easy fix. I don’t like returning to “finished” dresses, but maybe when the weather cools down I’ll be motivated to do that – and re photograph it with my fuller petticoat! Despite my annoyance with making the bonnet, I do love the profile it has! And I like this photo almost enough to ignore all the rippling at the back (okay, not quite, but close)! Thank you for reading, and for all the comments on my posts about making this. I’m looking forward to sharing some other photo sets (and progress posts) very soon! Today I’m dipping my toes into 1918, and the wonderful fashions it has to offer. I actually researched this period quite heavily earlier in the year when I was pursuing a design job for something set in the early 20’s. The job didn’t work out, and it left me a little bitter towards the era. But this weekend my mom and I booked tickets to the Downton Abbey Exhibition and I thought it would be fun to wear an understated period costume to the event. The late nineteens are a perfect period for casual historical dress since the silhouette (though more modest than what is fashionable now) wasn’t dramatic like the early 1910’s, or the later 1920’s. Though corsets would have still been worn during this period, waistlines were starting to widen and you can get away without one. Perfect since I would have to wear this for four hours of public transit! I based this ensemble mostly off of two ads: This one for the blouse, and this one for the skirt. I also made a coat to wear over it, which was based on ones from a winter Sears catalogue. I had all the materials for this on hand, and made it over a 4 day period (some of those were half days with Thanksgiving and all). I’m really pleased with the end result and this may motivate me to make more vintage themed clothing to wear on a regular basis! I started with the first piece: the camisole. I draped this on my dress form. Getting the right amount of flounce at the hem to create the proper silhouette was probably the most difficult part. This is it transferred to paper. The body of the camisole is made from silk charmeuse. This particular cut was *very* off color, so one side is more yellow than the other, but it’s only really noticeable at the back. I sewed a strip of wide cotton lace into the center (backed with more charmeuse) to serve as the statement of this blouse. I’m not sure when this lace is from, but it came from a collection that included pieces from 1910. Based on the design and weight I would not be surprised if this lace was also from that period. I outlined it with some zig-zag edging to add a bit more texture. The collar of the camisole is also charmeuse, but I backed it with fusible interfacing. Then I stitched a half inch away from each edge, and used that as a guide when turning the edges inward. It was pinned to the top edge of the camisole, with the right side facing the wrong side. Once turned the right way out all the raw edges will be hidden! Then I topstitched the bottom edge down. The bottom edge was gathered slightly at the front and sewn to an interfaced waistband. The final addition were straps, made from bias cut strips sewn into tubes. The back closes with three glass buttons. This is the first time I’ve done functional button holes in…3 years? Maybe longer? I finally bought a home sewing machine, which though slower than my industrial, has some stitches and features that I’ve missed! The automatic buttonhole is one of those things. It is a SINGER 4423 Heavy Duty *, if you were wondering. I go more in depth about it (and all my sewing machines) in this video. I used the camisole as a base for draping my next pattern: the blouse. I believe these pieces would have been combined in the 20’s, with a closure hidden on one side. But I thought making them separate would make the pieces more versatile. And the camisole also provides enough coverage that I didn’t need to wear a slip over my bra. Here is the pattern I ended up with. It’s shaped by pleats below the shoulder with a drawstring waistband. I cut all the pieces out from a thin, crisp, silk shirting. This fabric was a dream to work with – I’ve never had something make french seams easier! I didn’t take a lot of progress pictures for this, since it came together in a single evening. But here you can see the main pieces assembled. All the edges were finished by machine with rolled 1/4″ hems. Seams were flat felled, or finished with lace binding. And the bottom edge was turned inward to create a channel for ribbon. I tried to draft the sleeve pattern for this the historical way, but I got confused and made it up instead. This worked surprisingly well! Fit the armscye perfectly on my first try. I just had to adjust the length and width a little. The cuffs were gathered by machine. Then sewn onto the cuffs. The raw edges were bound with lace binding. I wanted to add button closures but didn’t get the buttons (or know what size they would be) until the day before wearing this piece, so I used hooks instead. The sleeves were sewn on by machine, then the raw edge was bound. I also made the collar. This was assembled from a layer of the checked silk, which was backed with interfacing, and a layer of silk charmeuse, which was supposed to be lining. I sewed the layers together with the wrong sides facing each other, then topstitched around the edge. It looked great! Until my iron smeared burned goop all over the corners of the checked side. I couldn’t get it off, and I didn’t have a lot of fabric left…so I made the charmeuse side face out instead. I actually really like the contrast of this, so it was a happy accident. But it means the topstitching looks a little sloppy since it was originally done on the other side. I sewed the collar on by machine, then tacked it down a half inch away from the edge to keep it in place. The final touch were silk covered 3/4″ buttons. Three on either side of the bodice, and two on each cuff. I also added a snap just above the top button to secure it to the camisole. And the back! I didn’t expect to love this as much as I do, but I’m really happy with it. It’s delicate yet structured and so different from anything I’ve done before. I usually shy away from thin or slippery fabrics, unless I’m using them as an overlay. But making a tailored piece out of them was surprisingly easy and fun – I think this will motivate me to branch out more with my fabric choices. Unfortunately the skirt didn’t go as well. At all. My first attempt was made from a beautiful wool, but the finished skirt looked awful. It had a wide, rounded waistband that made me look so heavy. There was also way too much fabric, and it drooped at the seams. It was supposed to have pockets, which I tried making out of a contrasting wool, but then there was way too much contrast. So I remade them from matching fabric and it looked even worse! The whole thing was an unsalvageable mess. Attempt number two was made in three hours from a purple chevron fabric I got from the plaiditudes collection at Jo-anns. I draped the skirt design on my dress form, then used the muslin as a pattern, adding seam allowances by eye. It was SO messy, but the end result turned out a million times better than my first attempt. This skirt has way less volume, and has pleats in the back instead of gathers. The waistband is still wide, but it’s straight which is a lot more flattering. And there is decorative seaming down the front instead of pockets. It’s not my best work, but it fit, and it looked pretty good! I think the same can be said about the jacket. This piece was actually drafted, partially assembled, and completely cut out over a year ago – I even made a video about it. I planned on this being my winter coat for 2016, but after buying a glorious winter coat from J-Crew I lost interest. The jacket also had some issues I wasn’t happy with. I ran low on material so I couldn’t make the skirt as wide or long as I wanted (it actually has plenty of volume, so I’m sort of glad for that now). I also had to ignore the grain line on some pieces, and didn’t have enough left for a matching hat which I was originally really excited about. Plus the topstitching on this jacket was plagued with problems. It kept skipping stitches, which meant I had to sew over them again, leaving backstitch marks. This was made worse by my plan to use contrasting stitching during construction. Even though this was only a year ago, I’ve learned a lot about my machine since then and working with heavier fabrics in general. Unfortunately that helps me moving forward, not with the issues this jacket already had. To fix the topstitching I would have had to completely disassemble the bodice and remove it all by hand. And that still wouldn’t resolve the grain line or length issues. But I already had a lot done. So I decided to take a half day and get it finished, fully knowing that it was impossible to make it perfect given its other issues. …in less than a day. Surprisingly, it turned out okay! I’m not going to share close ups since the finishing isn’t great at all. The interior skirt seams were left raw, and the topstitching got a little messy at points. But it’s finished, and I love the shape and design of it. Hopefully I can reuse the pattern for a similar jacket, made to my current standards. It’s a little wrinkly from yesterday. And that is it! Four pieces in four days. All together I think they looked lovely. And it was surprisingly comfy and weather appropriate! I accessorized the ensemble with a pair of Katie & Kelly shoes (these were like $12 on clearance at DSW last year) and the Authentically Academic bag from Modcloth. I had gloves from the 40’s with me too, along with a 50’s themed pair of Quay sunglasses…so it was a little all over the place, but very retro. For my hair I slept with a mixture of 3/4″ and 1″ curlers in, all wound inward towards my face. In the morning I brushed them out, then tucked the ends under and pinned them to the base of my scalp. Sort of how you would do a faux bob, but the volume from the curls makes it look more like a fancy up do. I teased my bangs a bit and pinned them to the side. Then sprayed my hands with hairspray and used them to smooth and flatten the top before setting it with a heavy misting. It’s probably more of a 40’s style than 1918, but I felt it looked passable. Any loose bits are probably from me trying to adjust bobby pins after putting the blouse on and getting the buttons caught in it. That happened several times. That is it for today! Thanks for reading! My next post will be about the exhibit itself! As promised, today I have the photos of my 18th century redingote ensemble to share! If you missed them, the blog posts about constructing this dress can be found here, and here. For the fourth year in a row I went to the local pumpkin patch to photograph my newest piece. I really love this as a backdrop, there is something magical about it in the morning! The lighting is so pretty, and the contrast between the field, mud, pumpkins, and corn makes me smile. My dresses always get a little dirty there, but it’s nothing a bit of water can’t fix, and I think the pictures make it worth it! If you want to see the layers in a little more detail, I have a video showing the process of getting into this – and a few clips of me wearing it! It can be watched here. And that’s it! Thanks for reading! Making 18th Century Jumps – And how they look worn! Today’s post focuses on a project that I did a terrible job of documenting (to be honest, that’s been most of my projects recently). It was also completed more than three months ago, and in progress long before that. So even if I did have a lot of photos of making it, the details are a little fuzzy in my eyes. The reason this was so poorly documented photo wise is because I filmed the whole process. And up until last month I only had one camera, which didn’t let me take photos without disrupting the filming process. This is bad news for those of you who like written descriptions, but if you are more of a visual learner the videos showing all the steps can be found on my youtube channel (here for the jumps, and here for the skirt) or down below depending on your email settings. Now what is this project? It’s my second adventure into casual 18th century costumes. If you read my posts about making this dress than you may be familiar with my fascination towards what was considered casual hundreds of years ago. Even though that dress was considered “Undress” it still required getting into stays and I felt awfully formal when wearing it. I wanted to stick to the same undress theme but make something that looked and felt different. Unsurprisingly I found inspiration in Fashion: A History from the 18th to the 20th Century* , specifically this ensemble that consists of silk jumps and a matching skirt. 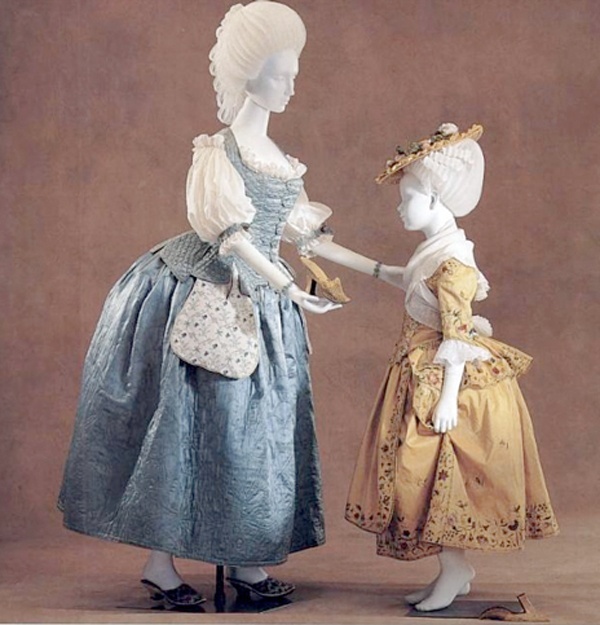 While researching that I came across a blog post (which I’m so mad that I can’t find again – I think it may have been on the American Duchess blog) that talked about French fashion being considerable more casual in the 1700’s than most of Europe. With an emphasis on practically in dress (so, not skirts so long you would trip over them). I had also been seeing ads everywhere for the live action Beauty in the Beast movie, which got me thinking about what a historically accurate version of the famous blue dress would look like. With enthusiasm coming from those discoveries (and dozens of fashion plates) I got to work! I started by draping the jumps. For those unfamiliar with these garments, they were a support garment most often worn by working class woman. They are conical shaped down to the waist, but usually flared out beyond that point so they could be worn over skirts.Their structure comes from layers of fabric quilted together rather than boning. This makes them a lot more comfortable than stays, while still providing some shaping of the torso. Here is the front of my draped jumps – this was tricky since I’m draping over a dress form made from hard foam. When the garment is actually worn my body (especially my bust) will compress to be a different shape. If you don’t have a dress form, or find this hard do bypass, I think you could get away with altering a 18th century riding coat pattern. The shape and structure of this is similar, it just sits higher on the shoulder and has a smaller skirt. And the back. I draped this over the appropriate petticoats to make sure there was enough volume in the tabs. I traced the pattern onto paper, then made the necessary alterations so it had more of a conical shape, and added seam allowances. After a quick mock up I moved onto the final garment! I cut all the pieces out from the top layer of fabric (a home decor material from Jo-anns), a cotton for lining, and quilt batting. The first step was marking lines for the quilting onto the lining. These are diagonal across the pieces and a half inch apart. All the lines line up at the seams to create a subtle chevron effect (which was probably more trouble than it was worth). The quilt batting in sandwiched between the lining and the home decor material. I trimmed the quilt batting so it didn’t extend into the side seams, then got to sewing! The first two panels done – I used a pale blue thread and longer than average stitch length. These panels were my test, so after it worked I repeated the process with the front and back pieces. The rest of the lining cut out and marked. You may notice that the only seam allowance is in the side seams. The rest of the edges will be bound with binding, like stays. Now here is my major regret – I hand stitched the seam allowance down, and hand sewed boning channels into the interior of this to add more support. I don’t regret adding these channels, but hand sewing them was a terrible idea. It was so slow and not nearly as sturdy or clean as I would like. If I made this again I would make another lining layer from lightweight cotton, add the boning, then sew it to the interior of the quilted bodice before attaching the binding. It would be a lot faster, shouldn’t add too much bulk, and would look so much better! Now for the binding. I’ve mentioned my hatred for binding concave curves many times, and that still runs strong. It was made a lot worse on this project because of fabric choice. I choose to use this polyester suiting I bought many years ago (if you’ve been around since my Napoleon costume, this is the scraps from that! ), since it was the best match for the floral design. This frayed so much, and seemed to pucker rather than stretch, even though it was cut on the bias. I machine stitched one side, then turned it inward and whip stitched the other side to the lining. It isn’t very even since parts frayed away to nothing before I could sew them, but from a distance it looks okay(ish)! To make the curves look a little bit better I blanket stitched around them with embroidery floss. Then I sewed eyelets into the front. I assumed since this fabric was quilted it would be thick enough to hold the eyelets. I was wrong – they haven’t torn out, but they are really warped after a single wear. Definitely should have added canvas to the front few inches to avoid this. I also bound the arm openings. And that is it! Overall I think they are pretty, just a couple of things I would do differently next time. And there will probably be a next time, since I really like the shape and functionality of this garment and am itching to make another! Maybe out of maroon and gold jacquard? With a shantung skirt. Speaking of the skirt, I literally have no photos of it or the construction process. It has three panels (two in the back, one in the front) and a pleated waistband with side closures. The hem is straight, with the length adjusted at the waist. But the hem didn’t end up being that level, since the weight of the additional fabric in the back flattened my petticoat and made it appear several inches longer than the front. Speaking of petticoats: I used an ample bum pad with the cotton/tulle petticoat overtop. The tulle was pinned up quickly before photographing this, which is the reason for any skirt lumps. This skirt fabric was a lot thinner (but also weirdly heavier) than I had expected and would have suited a quilted petticoat much better. The shoes are, as per usual the Funtasma Victorian-03* (I’m looking into getting a more 18th Century appropriate pair soon, I swear!). I used my real hair with a few feathers and fake flowers stuck in it. I made the chemise from some fabric I had around. And the apron is from what I had leftover. It’s two rectangles of fabric with curved tips, and a lace overlay. I gathered the top and used lace to bind the edge and form the ties. Overall I like this ensemble. Especially the fit of the jumps. I think from a distance it’s really lovely, but I want to remake it with different materials and a slightly different construction strategy! That’s it for this one! Thank you for reading! A few weeks ago I got three projects photographed, including my Striped Edwardian Gown, which is the one I’ll be sharing photos of today! I have two blog posts about making this dress and hat. They can be read here, and here. This dress was such a fun project to work on, and I’m really happy with the end result. It fits nicely, I have a lot of mobility in it, and I think it looks quite authentic. To add to the authenticity I decided to use my real hair for this shoot – and I’m so glad I did! It looks a lot softer and (for obvious reasons) more realistic than my wigs. My styling skills have ways to go, but I’m going to practice and use my hair more often with future projects. As far as foundations go, I wore this costume over my white and pink chemise, my pink and white corset, a bust pad, and white chevron socks…And I’m just realizing I never blogged about any of those pieces. But you may have seen them in spotlight videos on my youtube channel. Since the shoes show, I bought a pair of these* in white – which aren’t as comfortable as the black ones, but compliment the dress nicely. And these earrings* which are from the Downton Abbey collection. I was so comfortable wearing this costume. I’m not sure that shows, but it was the best I’ve felt in a costume in a long time! That’s it for this set, but I will have more to share soon! I haven’t been thrilled with what I’ve accomplished so far this year, and seeing photos of completed works makes me feel a bit better about things. So I have plans to take more soon. As promised, here are the worn photos of this years Christmas Costume! These were taken at a Christmas tree farm. This was our fourth years photographing a costume there, and I think this year was the most successful. The lighting was on our side for once, and it’s easier to focus on a red dress than a white one. It’s also a really easy dress to lay out and walk around in since there isn’t a petticoat. The only downside was it being a bit muddy and really cold. It isn’t a practical dress for December. But I think it looked lovely in this environment, so I’m glad that I didn’t let that stop me. Construction notes on this dress can be found here. And making of videos are posted here. And that’s it! I think I have one more post going up before Christmas, but incase I forget: I hope you all have a wonderful Christmas, or Holiday, or if you don’t celebrate, then a really great week in general. Thanks for reading! Today I have another set of photos to share. Much like the last photos I posted, these have an autumn theme and were taken in a pumpkin patch. I thought it would be make the perfect lighthearted backdrop for a wacky dress like this one, and it did not disappoint! This was my first time having the whole ensemble on and I was pretty pleased with it – everything fit and was really comfortable. I was a bit concerned the petticoat would show, or that the bonnet would slip around, but neither of those were an issue. Before getting into the photos I wanted to mention my last post, where I reviewed a bunch of costume reference books. If you’re interested in any of them this is the time to buy! Amazon has $10 off book purchases, and Barnes & Noble has 15% off your order, which makes the price of those pretty inspiration books a bit easier to manage! And some muddy boots after a long morning! Luckily none got on the dress. Today I have some photos of my completed Orange Taffeta Dress to share! We photographed it in it’s natural habitat – a pumpkin patch! These aren’t my favorite costume photos (I probably prefer last years) but I’m just happy we got some that were usable. The day we photographed this it was insanely windy to the point where the dress wouldn’t lay out properly. And since it was so difficult to control the dress I wasn’t comfortable walking in the dusty or potentially muddy areas, which left us with limited background options. Luckily we managed to get a few I really like – though I would like to get more photos of it in calmer weather in the future, it has a lovely silhouette when it isn’t being battered by wind! Construction notes about this dress and hat can be found here, here, and here. It was worn over a steel boned 1880’s style corset which was made from a pattern from “Corsets & Crinolines” by Norah Waugh. The skirt is supported by two petticoats that were taken up by three inches the night before this shoot so they would sit properly underneath the skirt. I also wore it with these boots* – you can’t see them in the photos, but they made me feel more authentic which has to count for something. This one is my favorite. I love how the light catches the feather, and the waistline makes me feel better about how uncomfortable the stupid corset was! The abundance of “looking off into the distance” shots has to do with it being really sunny and that being the only way I could fully open my eyes. And that’s it! Thanks for reading – a new “Making of” post should be up tomorrow! This post was supposed to be a simple fabric haul…but then I got a bit chatty. And I wanted to include some shop reviews and photos from my recent trip to the Metropolitan Museum of Art. So it’s some sort of shopping adventure/review/haul hybrid. And unlike most of my hauls, the majority of these material weren’t purchased in NYC! Most of them are from shops near Lancaster Pennsylvania, then I picked up some matching fabrics to pair with them in the garment district. The first shop I visited in PA was Fabric Mart. I had heard of this shop before since they have a pretty well known website, but it wasn’t until I researched fabric stores near Lancaster that I realized they have a brick and mortar shop as well! This store didn’t look too promising from the exterior…and the inside wasn’t that inspiring either. Since the store is made up of three rooms, and it isn’t immediately clear that the back rooms are open to customers, it looks quite small when you first walk in. It also wasn’t as densely stocked as a store like Jo-anns, so I was a bit concerned I wouldn’t find anything. But once I started browsing I was a lot more impressed. They don’t have a ton of fabric, but they have a good variety of materials and relatively unique fabrics – especially when it came to silk. Lots of patterns and designs I’d never seen before, even in places with far more options like the Garment District. It wouldn’t be the best shop to go to if you were looking for something specific, but I was just there to find pretty fabrics and it was definitely a good shop for that. However It wasn’t my favorite shopping experience. None of the fabrics were priced – they didn’t even have paper signs to give you some idea of the price range. And none of the employees I spoke to knew prices offhand. Instead you had to go to their website and type in the fabrics item number. I used data on my phone for this, but if you didn’t have a smart phone you’re dependent on a single computer in the center of the store. Even with the phone it was a pain since I was constantly forgetting the prices of each fabric, and some bolts didn’t have any item numbers visible. They also handle customer service (a team of several people behind desks) for the website in the same room you shop in – which I understand due space limitations, but I felt really awkward and like I was in peoples way. But I would go back if I was in the area! And I’ll considering ordering from them online in the future, since I did like the selection and uniqueness of their stock. The first fabric is from their dollar a yard section. It’s a light pink polyester satin covered with bright pink roses. I absolutely adore this fabric and the style of the print reminds me of how flowers were painted in the 1700’s. Which is why I want to use it for an 18th century robe a la francaise – something i’ve been wanting to make for ages. I don’t think the print is accurate for that period, and i’m not sure how well the fabric will pleat, but I think it’s worth a try. I got eleven yards of it, and as I said it was from the dollar section, so the whole bolt only cost me $11! Then I picked up a coordinating fabric in the garment district. This will be used for trims and potentially the petticoat. I ended up finding this material at Zahar fabrics, which is one of my favorites since they have a bit of everything and good prices. However I wasn’t expecting to find this there. I went there to look at chiffon, but on my way to the chiffon section I saw this beautiful silk dupioni, which matches the floral satin — perfectly. Which is fantastic since I needed a warm (almost coral) pink which I thought would be difficult to find. In addition to being the right color, It has a lovely sheen to it and drapes beautifully. Though the slub is more intense than I usually like, it’s very consistent throughout the fabric so they don’t look like random snags. I’d budgeted forty dollars for this fabric, which I expected to get me four yards. But I ended up getting five and a half yards for that price, since that was all that was left on the roll! The next purchase from Fabric Mart is a mesh embroidered lace. This was from the home decor fabric and on sale for four dollars a yard. I ended up purchasing two yards, and I think it will look beautiful as the trim for an Edwardian gown. The threads used on this lace are almost metallic, which gives it a lot of life. I actually have some purple chiffon that matches this, so hopefully I can figure out a design that pairs these two materials together. From the silk section (which I spend ages staring at) I bought a yard of this lightweight beige silk. The base fabric has a lovely subtle sheen to it, but it was the metallic stripes that won me over. They have the most beautiful shine to them, it’s so pretty. I think this would make lovely sleeves for a historical dress – maybe paired with a gold or navy brocade. And my final purchase there was this silk shantung which has black velvet flocked designs all over it. I can’t even put into words how much I love this fabric, it’s so striking, i’ve never seen anything like it. It was the most expensive fabric i’ve ever bought (not including beaded lace) but even the price couldn’t deter me, i’m that in love with it. I’m not sure what i’ll use this for, but I bought two yards which should be enough for something neat! The next shop I went to is called Goodvile Fabric Outlet/ Zinck’s Fabric – they recently combined and can be found under both names. This store was an experience, truly unlike any other fabric shop i’ve been to. The store is actually a giant warehouse. The front room is carpeted and looks like a normal quilt shop, but the rest of the space is filled with hundreds of pallets of apparel and upholstery fabric. A lot of it was very poor quality – in the whole store I found less than a dozen fabrics I really wanted, but seeing that quantity of fabric was incredible. And it was all really cheap. The flat cuts shown above were a dollar a yard, as were many by the bolt fabrics. I picked up two of the flat cuts from the home decor section (the only ones soft enough for apparel use) but they didn’t photograph well so I haven’t included photos in this post. I also got a twenty five yard bolt of white organza for twelve bucks, which I was pretty happy with since i’ve wanted to make an organza petticoat for a while. My by-the-yard purchases included six yards of this bright plaid cotton. This fabric is very fine and very soft and I thought the bright print would make it good for something out of the 1830s – it’s been too long since I paired massive sleeves with a pleated collar! From the same section I got a light brown and white plaid fabric. This is very lightweight as well, but has more drape to it, like a medium weight rayon. It feels very nice to the touch and I thought it would make a pretty dress from the early 1800s as well – maybe something regency inspired? This fabric, and the bright plaid were both four dollars a yard. I also bought a flat cut of a cotton homespun – I think these were two dollars a yard once discounts were factored in. This piece is almost six yards long and has a very small green and beige checked print. I think the color drew me to this one, I love green and it’s rare for me to see an apparel fabric I like in that color so I snatched it up! This shop had a limited suiting section, but what they did have were stunning. Very soft lightweight wool suitings – and only three dollars a yard! The first one I got is a medium brown with small blue and pink stripes. And the second one is black and white chevron. I bought these both for suits based on designs from the early 1900s. Tailoring is something I want to get better at, and these are light enough for the menswear inspired dresses that were popular towards the end of the Edwardian period. The final fabric from this shop is a polyester satin charmeuse – not usually a fabric I go for, since it tends to look quite inexpensive, but this one has a really nice sheen to it. I had hoped this would match the lace I purchased from Fabric Mart but it’s a little bit too light – i’ll see if I can make it work, otherwise it’ll go in my pile of mock up fabrics! Oh and I bought some buttons too – these were 80c each and I thought they would be handy to have around since I don’t have many small, simple buttons. The next store I visited is called The Lace Place. It was a slight struggle to get an appointment here, but i’m glad we did! The store was a lot larger and had a lot more stock than I was expecting. It’s set up a lot like the stores in the Garment District, which is interesting to see in such a rural area – we drove past miles of corn fields and cows to get here! This shop had a great selection of nylon and colored lace. I found the cotton lace a bit stiff, and the selection of venice and embroidered lace lacking, so I didn’t get many of those. But i’ve never seen this many colorful trims in one place – and in every small pattern imaginable! The store owner was very nice, and the prices on the narrow trims were very reasonable and well marked. The only negative I can really say is that the checkout and cutting process was slow (especially for fabrics) so I wouldn’t recommend it if you’re tight on time. But if you like lace and you’re nearby it’s definitely worth stopping at! My main purchase here was eleven yards of white netting that has gold spots woven into it. I bought this because I thought it resembled the material on Sisi’s star gown. The spots are too close together for it to be used for a replica, but it should work for something similar. Either on its own or as a base for sequins. This was four dollars a yard but twenty five percent off since I bought more than ten yards. On top of that I got quite a bit of lace, including three white cotton trims, five small off white ones, and a beautiful embroidered organza one. A lot of these are similar to trims I already own, but most of my trim collection is made up of vintage items which so some signs of age, and it’s nice to have some that you know are unblemished! An interesting pin tucked cotton trim that I thought would look neat on a corset, a white pin tucked organza that I thought looked cool, and a beautiful alencon beige lace – I can’t wait to embellish this and use it to trim the sleeves of an evening gown, it’ll look stunning. And some colorful trims to help build my collection. I thought these might work for lace inset work as well. And the yellow ribbon lace is to top off a corset that I finished recently – it matches much better than what I found at Jo-anns. From the same store I got three grab bags, which were a dollar fifty each. These were such a steal, all of them have a couple lengths of lace that are three to five yards long, along with many pieces that are half that length. It had a lot of fun opening these up and organizing the trims I got. Definitely worth the money, and a joy to look through. And now back to the fabric shopping. The final store I visited is called Zooks. It mostly sells quilting fabrics but I did find a few things that would work for my costumes. The first of which is this plaid orange cotton homespun. I liked the color of this, it made me happy, and the price made me happy too – it was two dollars a yard with an additional twenty percent off. I got all the had left (a little over seven yards) and plan on using this for an 1840’s day dress. From the small apparel section I got two yards of a silky feeling dimpled orange fabric. This matches the homespun material perfectly (for some reason that fabric looks more red in photos) and has a really interesting texture. Hopefully i’ll be able to pair them together. From a different quilt shop (I forget the name) I got some embroidery floss, since it was reduced down to four for a dollar. I bought some greens and oranges which I can hopefully turn into some sort of floral sampler. Embroidery is one of those things I really want to improve at but keep putting off learning more about. The final few things I got were from the venders section of a quilt show. My first purchase was this magnificent quilting cotton which has unicorns on it. Unicorns are one of my favorite things, and seeing that combined with fabric was wonderful. I got a yard and a third of this, and I plan on using it to re-cover my ironing board. I think it will look adorable with unicorns running across the bottom! I also got a pair of support gloves for my wrists. My wrists are pretty good considering how much time I spend sewing and on my computer, but they do have bad days. I didn’t have super high expectations for these, but I was willing to give them a try. And I’m really glad I did, because I notice a huge difference when I wear them. I put them on if my wrists are feeling sore and they alleviate the pain by around ninety percent. Which means I don’t have to slow down or take breaks, which I definitely appreciate. I’m not sure that these would work for everyone, or if you have more severe pain, but i’ve been really impressed with them! I also bought a wallet, which is a bit silly but very…me. It’s pale blue and has a vintage singer sewing machine on one side, and crossed crane scissors on the other. I justified this because it’s more secure than my previous wallet, and smaller so it fits in my purse better. But I think you can get better wallets for the price, I just fell for it because it’s sewing related. But I don’t regret it at all because look! So pretty. And the final thing I got in PA were buttons. A lot of buttons. There was an antique shop selling a box of buttons for fifteen dollars, and a scoop of buttons for three dollars, with twenty percent off everything. These are metal buttons which I think are new old stock. They say “Waterbury company” on the side, which is a local button manufacturer who has been providing buttons to the US military for almost a hundred years. I got a box of big ones and two scoops of small ones – all of which totaled seventeen bucks. Not sure what they will be used for, but I figure I could always sell them on etsy and make my money back. Now onto my NYC fabric shopping adventures. The main point of this trip was the see the Manus x Machina exhibit at the Met. But it doubled as a fabric adventure, and a very successful one at that. My list for this trip was relatively small so I could really focus on finding the materials I was interested in. I managed to find everything I wanted so I was very happy! The first thing I needed was some fabric to match a plaid fabric I ordered online a while back. This is a very bold print so I needed something to break it up. Luckily I found a matching cotton sateen in Hamed Fabrics, and it was only five bucks a yard. Then I went to Diana’s fabric, and I was on the hunt for something specific. Last time I was there I fell in love with a blue and white striped taffeta but decided it looked too nautical and that i’d already spent enough money that day. And I’ve regretted not getting it for months. I went back this time with hopes they would have some left. When I first walked in I was concerned, because all the bolts of striped taffeta were gone. But I had a brought a swatch with me and asked the owner if they had it hidden anywhere. Apparently it was in storage, but they sent someone to fetch it and in a few minutes I was reunited with this beauty. I recalled this fabric being priced at fifteen dollars a yard, and I needed at least seven yards. I had hoped to talk them down to twelve dollars a yard, but by some miracle I got it for ten dollars a yard. Which is an absolute steal in my opinion – it’s fifty four inches wide and has a beautiful texture and sheen to it. My plan for this is to make a matching skirt and polonaise that plays with the print of the fabric. I also have a striped organza from a previous trip that I want to use as trimming for this dress, I think that would look very cute! While I waited for them to find that fabric I looked at their solid silk taffetas and shantungs. I had hoped to find one in a bright color or jewel tone, something that would work well for an 1890’s day dress. I attempted to make one of these earlier in the year, and though I did finish it, I despise the end result. The fit, the design, the fabric, the length, it’s all bad! I want to take what i’ve learned from that project and apply it to a new, much nicer dress, that has the same inspiration behind it. And this time around I wanted to use a fabric that drapes nicer than polyester taffeta. They didn’t have too many colors that interested me, but this bright orangey yellow caught my eye. I was hesitant about this fabric since it’s different then the colors I usually go for, but I didn’t want to let that stop me, and once the fabric was rolled out and I handled it I couldn’t resist. It’s so crisp but soft and light in a way polyester taffeta isn’t. I’m so incredibly excited to work with this and give this project another shot! And my final two purchases are for an 1880’s evening gown. I already have the main fabrics for this (a jacquard and beige taffeta that have been in my stash for years) but wanted something softer for ruffles around the neckline and skirt. I had hoped to find a chiffon, but they didn’t have any in the right color. However I did find a very pretty satin faced chiffon that matched, so I bought that. At this point the only thing left on my list was a lace fabric for this project. I finally stumbled upon this one in a shop i’m not super familiar with. It was more than I wanted to spend (fifty dollars a yard!) and since I only needed a half yard I couldn’t negotiate a better price. But since I couldn’t find anything else that matched, I decided to get it. And I don’t regret it – it’s truly stunning and matches perfectly. And that’s it for fabric shopping but I wanted to share my thoughts on the Met exhibit – i’ll try to keep this short since i’m sure there are far better summaries and photos of this out there! I found the exhibit a lot more interesting than I expected. I think the write up on the website is a bit misleading – I thought it would be focusing more on machine made garments, but it was all about the hand sewn details and variety of textures. There were dozens of beautiful fully sequined dresses, some made fully from feathers, and others that were entirely lace. Though I didn’t like all the dresses (there were some collapsable dresses by a Japanese designer that seemed really out of place, and some “deconstructed” ones that were just…awful, in my opinion) I was really impressed by the majority of them. The dresses on the left were some of my favorites since they remind me a lot of the dresses the stepsisters wear in the Cinderella live action film. And of course I managed to fixate on one of the oldest dresses they had – this 1920’s gown was beautiful. I’ve actually pinned photos of it on pinterest before, so seeing it in person was a treat. I love how heavily embellished it is while still being very light and airy. Plus the ribbon embroidery was beautiful – it makes me want to learn how to do that! I also loved seeing the vintage Dior dresses – of which there were probably twenty. I think they are a benefactor for the museum, which probably had to do with their prominence in the exhibit. But I didn’t mind because they were all stunning! However out of all the dresses, the one that really stuck out is this Givenchy dress. If you’ve been around for a while you may remember my weird idea of making a vulture inspired costume. I purchased the fabrics for it but never settled on a design I was happy with, so it never came to life yet. However this gave me major inspiration! I love how the bodice looks like armor, but it has the softness of fabric. It gives me lots of ideas, which is more than I can say for the others. And I think that’s everything I have to say. It’s definitely worth visiting if you appreciate embellishment and pretty dresses!